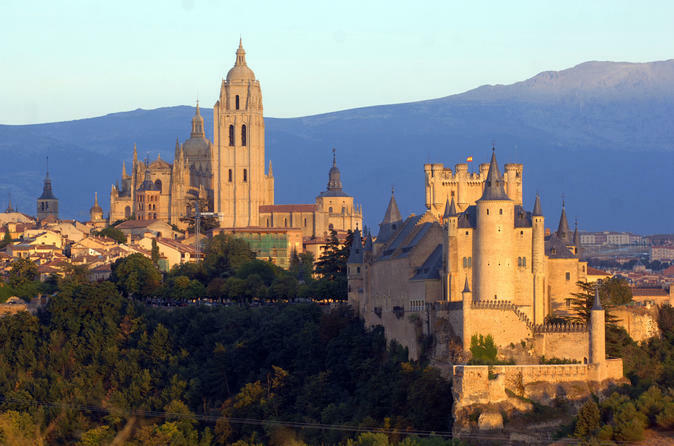 On this Full-Day tour from Madrid, see UNESCO World Heritage sites of Toledo and Segovia. Travel by bus to the Historical City of Toledo, accompanied by a bilingual guide, to contemplate the three different cultural legacies. Visit its Narrow Streets, Churches, Mosques, Synagogues and walk along its walls by enjoying the views of the Tajus River. The round trip to Toledo also includes a fantastic panoramic sightseeing in which you will enjoy the best views of Toledo. After Toledo, the tour will continue through the spectacular city of Segovia. The starting point in Segovia will be the Roman Aqueducts built almost 2000 years ago. Then, the tour will continue through the alleys, discovering its Historic Center to reach the Plaza Mayor, where the Gothic Cathedral of Santa María is located. Also find its Jewish Quarter, followed by a visit to the spectacular Alcázar of Segovia.